I’ve been a bit quiet the past few days. The weekend was full of eating food not cooked by me, so I haven’t had a new post until today. Last night I had a couple of my favourite girls over for dinner, and after back and forth emails, I narrowed the meal preferences down to healthy, yummy, not containing nuts or coriander. Easy enough. 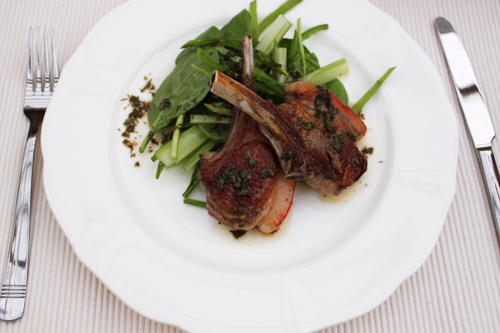 So I flicked through my books and found a recipe in Donna Hay’s Seasons – mint and apple lamb with crunchy salad. Yum! I altered the original recipe slightly, for example I didn’t use radishes as I’m not the biggest fan. I would have preferred to use fennel, but the fennel currently being sold in the shops is below average, so I settled with some fresh baby spinach which worked perfectly. The recipe said to blanch the snow peas, but I completely misread this and served them fresh. The recipe also called for dressing the salad with the hot apple sauce, but this would have caused my fresh spinach to wilt down and no longer be a salad. So what I did is put the sauce in a separate bowl, and as the girls plated up, they could pour the dressing over the lamb and salad. This worked well as the sauce had also cooled down slightly by then. Heat a frying pan over a high heat. 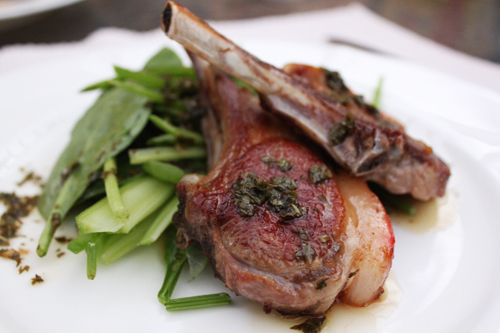 Lightly drizzle the lamb cutlets with olive oil, then place on the pan and cook for 3 minutes each side, or until lightly browned and cooked to your liking. Set these aside on a plate and cover. In the same pan, reduce the heat to medium, then add the apple juice, mint, salt and pepper. Cook for a couple of minutes until the juice has slightly reduced. In a bowl, add the sliced snow peas, radishes and celery (and spinach if you like) and toss to combine. You can add the apple mint sauce to the salad and toss, or add fresh to a plate, add the lamb, and drizzle the sauce over the plate. the most amazing meal, coupled with amazing company. perfect. Thanks Leon! It was delicious, and my first real attempt at cooking lamb, yep you read correct!